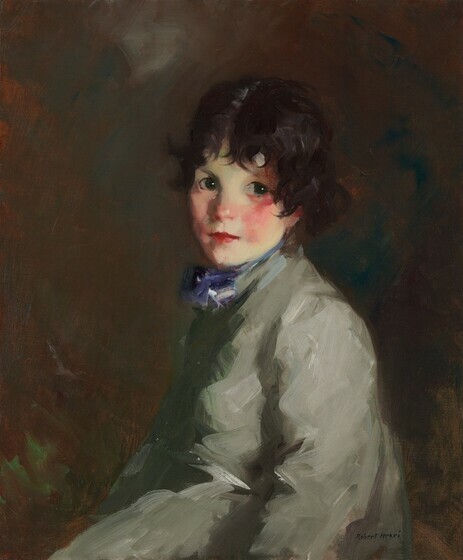 Robert Torchia, “Robert Henri/Catharine/1913,” American Paintings, 1900–1945, NGA Online Editions, https://purl.org/nga/collection/artobject/34637 (accessed April 20, 2019). Robert Henri, “‘My People’: By Robert Henri,” The Craftsman 27 (Feb. 1915): 459. Robert Henri, The Art Spirit, comp. Margery Ryerson (New York, 1923), 237–238. Bennard B. Perlman, Robert Henri: His Life and Art (New York, 1991), 110. He also traced his ancestry to Ireland, and in New York had befriended the expatriate Irish portraitist and writer John Butler Yeats, father of the noted poet William Butler Yeats. After traveling around the country the Henris decided to stay near the isolated fishing villages of Keel and Dooagh, remaining there until the end of September. Henri returned to Achill Island regularly until his death in 1929. It was done last summer in Ireland. We lived for three months on Achill Island (county Mayo) and my studio and our residence, as well, was ‘Corrymore house’ that was built on the wild, boggy side of Croaghan above the little village called Dooagh where Catharine lived. Captain Boycott—whose name has become a dictionary word—was the builder of ‘Corrymore’ and he lived there for many years. Dooagh is a mile below (and two to walk) at the water’s edge—a very old, primitive and very poor village made up of little white cottages, with walls of heavy stone, thatched roofs, and smoke from the turf fires coming always from the chimneys. Robert Henri to William J. Johnson, Nov. 5, 1913, NGA Library, Rare MSS 6, digitized 2015; copy in NGA curatorial files. Apparently Henri stayed in contact with Catharine, because he stated his intention of forwarding a photograph of the portrait to her that Johnson had sent him. See Robert Henri to William J. Johnson, Mar. 13, 1914, NGA Library, Rare MSS 6, digitized 2015; copy in NGA curatorial files. Oscar Doyle Johnson to John Walker, June 17, 1948, NGA curatorial files. The donor furnished a typed transcript of a letter from Robert W. Macbeth to William J. Johnson, October 28, 1913, in which he wrote, “If you aren’t as crazy about this little Catharine as I am and if your friends among the artists don’t congratulate you unanimously, I'll very much miss my guess.” The donor also provided two typed transcripts of letters from Macbeth to Johnson of February 7 and 24, 1914, in which Macbeth discusses arrangements for including a photograph of Catharine in a forthcoming sales catalog. In the second letter he wrote, “You may look forward to seeing ‘Catharine’ reproduced as typical of Henri’s work in our booklet. I wish it were as typical in subject as it is in its painting, but the trouble is with Henri’s other subjects—not with ‘Catharine.’ I wish he always turned out pictures as attractive as she.” Apparently the painting was never reproduced in the catalog. Purchased from the artist by (Macbeth Gallery, New York); sold November 1913 to William J. Johnson [1860-1942], Uniontown, Pennsylvania; by inheritance to his son, Oscar Doyle Johnson, Wynnewood, Pennsylvania; gift 1948 to NGA. For a discussion of the elder Johnson, a noted collector of American art, see Nicholas Chilcott, A Champion of American Art, Chicago, 1975; he refers to Catharine on p. 30. French, American and Italian Review, Oklahoma Art Center, Oklahoma City, 1963, no. 36. Robert Henri: Painter-Teacher-Prophet, New York Cultural Center, 1969, addenda no. 2, repro. Extended loan for use by Ambassador Peter R. Coneway, U.S. Embassy residence, Bern, Switzerland, 2006-2008. From New York to Corrymore: Robert Henri and Ireland, Mint Museum Uptown, Charlotte; Georgia O'Keeffe Museum, Santa Fe; Everson Museum of Art, Syracuse, 2011-2012, no. 12, repro. Infrared examination was conducted with the Kodak 310-21x, a platinum silicide camera with a 55 mm macro lens and a 1.5–2.0 micron filter. The paint surface is in very good condition. In 2001, the painting was cleaned and inpainted along the edges and at the bottom left. At that time it was also coated with a synthetic resin varnish. Macbeth, William. Paintings by American Artists: Colonial Portraits New York, 1913: 46, repro. Yarrow, William, and Louis Bouche, eds. Robert Henri: His Life and Works with Forty Reproductions. New York, 1921: 9, 104-105, repro. Pousette-Dart, Robert. Robert Henri. New York, 1922: unpaginated repro. Perlman, Bennard B. "Robert Henri." Art Digest 28, no. 19 (1 August 1954): 14-15, repro. American Paintings and Sculpture: An Illustrated Catalogue. National Gallery of Art, Washington, 1970: 66, repro. Chilcott, Nicholas. A Champion of American Art. Chicago, 1975: 30. American Paintings: An Illustrated Catalogue. National Gallery of Art, Washington, 1980: 173, repro. Williams, William James. A Heritage of American Paintings from the National Gallery of Art. New York, 1981: repro. 200, 202. Walker, John. National Gallery of Art, Washington. Rev. ed. New York, 1984: 561, no. 855, color repro. Leeds, Valerie Ann, and Jonathan Stuhlman. From New York to Corrymore: Robert Henri and Ireland. Exh. cat. Mint Museum of Art, Charlotte; Georgia O'Keefe Museum, Santa Fe; Hyde Collection, Glens Falls, NY. Charlotte, 2012: 144, no. 12, repro. Bennard B. Perlman, Robert Henri: His Life and Art (New York, 1991), 110. William Innes Homer, Robert Henri and His Circle (1969; rev. ed., New York, 1988), 247. Marjorie Henri to John and Dolly Sloan, July 5, 1913, quoted in Revolutions of Realism: The Letters of John Sloan and Robert Henri, ed. Bennard B. Perlman (Princeton, NJ, 1997), 216–217. This information, which Henri had written on a preview invitation to the 3rd Annual Exhibition of the National Association of Portrait Painters in 1914, was supplied by the donor; Oscar Doyle Johnson to J. Carter Brown, Feb. 9, 1972, NGA curatorial files. 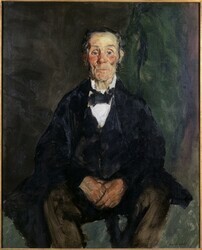 Henri painted another portrait of O’Malley in 1913: My Friend Brien (Mint Museum of Art, Charlotte, NC). Thomas McNamara, who arranged an exhibition celebrating the 80th anniversary of Henri’s first visit to Achill Island in 1993, in a letter to NGA director Earl A. Powell III, Jan. 4, 1993, NGA curatorial files, noted that Brien O’Malley had a granddaughter named Catharine. It is illustrated in Nathaniel Pousette-Dart, Robert Henri (New York, 1922), n.p. ; William Yarrow and Louis Bouche, Robert Henri: His Life and Works (New York, 1921), op. p. 104; Bennard B. Perlman, “Robert Henri,” Arts Digest 28 (Aug. 1, 1954), 15; and Alfredo Valente, Robert Henri: Painter, Teacher, Prophet (New York, 1969), op. p. 105. Oscar Johnson provided a letter he received from Robert W. Macbeth on Dec. 28, 1936, concerning Henri’s sister-in-law Violet Organ’s desire to use a reproduction of Catharine for the frontispiece of the second edition of The Art Spirit. William Innes Homer, Robert Henri and His Circle (Ithaca, NY, 1969; rev. ed., 1988), 252. For a discussion of Maratta’s influence on Henri, see Michael Quick, “Robert Henri: Theory and Practice,” in Valerie Ann Leeds, My People: The Portraits of Robert Henri (Orlando, FL, 1994), 47–62. Victor Rowland, unidentified Pittsburgh newspaper, November 1913, quoted in Oscar Doyle Johnson to J. Carter Brown, Feb. 9, 1972, NGA curatorial files. Infrared examination was conducted with the Kodak 310-21x, a platinum silicide camera with a 55 mm macro lens and a 1.5–2.0 micron filter.